Designed for applications where extra rough terrain and jumping may be encountered, as well as for vans. Sump is moved to rear for additional differential clearance and increased capacity. Features horizontal baffles. Fits 390-428 engines in 4WD vehicles & vans exc. Bronco. Features factory hard style fitting to attach factory style screw-in dipstick tube. Front of Pan to Sump: 14"
Milodon's Truck and Off-Road Oil Pans are designed with one-peice stamped steel and features ultra straight rails that ensures no gaskets leaks. 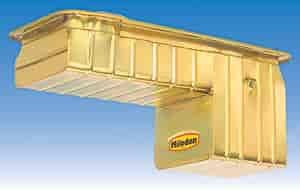 Built-in horizontal baffle delivers ultimate oil control for light to heavy off-road use. These pans fit 4wd chassis applications. JEGS Easy Kits are designed by JEGS professionals so you get all the parts you need.